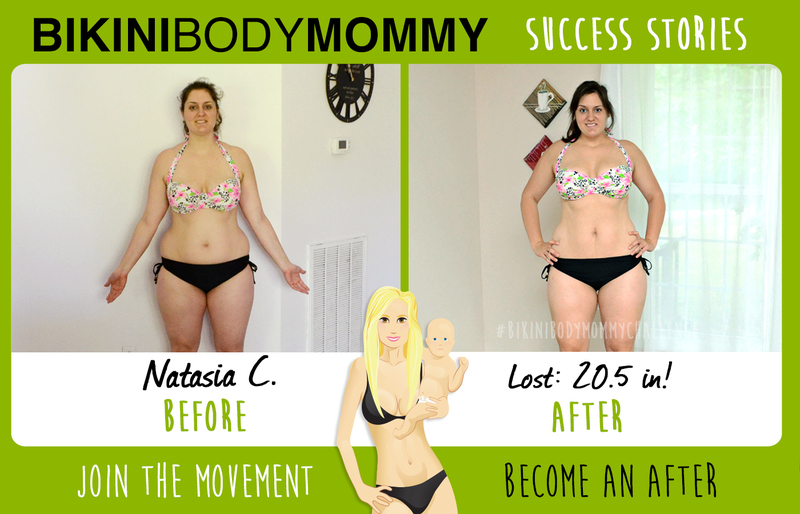 BIKINI BODY MOMMY™ — SUCCESS STORY: Natasia C.
I have known about you since I was pregnant with my son, started one of the challenges shortly after he was born, but it wasn't until this past January that I was really able to begin and find the motivation to stick with it. In the past 8 months I have only lost around 5 pounds, but with the 20.5 inches just this past 2.0 challenge, I am on my way to my goal size. I am now saying size rather than weight because looking as good as I do at 212 pounds, I do not know if 165 is still realistic. I know I need to lose actual weight, and I will, but my toning up and mostly the way I feel is spectacular. I have had fb girlfriends see my posts and join me for each new challenge, I have a mom friend with 7 kids who is planning to start the re-release of 2.0 with me, and I'm just so excited to direct anyone who asks to your webpage and fb and tell them how little time they need to begin getting incredibly more healthy. I am looking forward to some BBM workout gear and really hope to purchase the hard copy success journal by the time 3.0 begins, at least. :) Thank you for all you do. I know it is so much work, and I definitely appreciate what you put into this community. Newer PostSUCCESS STORY: Marla R.